In total Lord Christopher Holmes won nine gold medals, including the record six gold medals at a single Paralympics. He gained a string of World and European titles, broke 35 world records and was awarded an MBE for services to British sport at the age of 20. He was member of the Great Britain swimming team for seventeen years and captain for five. Currently, Lord Holmes is involved in promoting disability rights and welfare in his work with the Equality and Human Rights Committee. 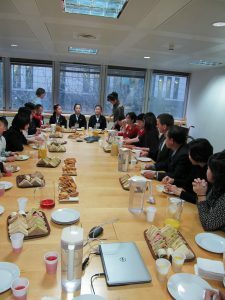 Our time with him at EHRC was valuable and memorable for the Youth Para-Ensemble, and for members of EHRC a fascinating experience. During the meeting, which the whole delegation attended, a question about the young people’s aspirations sparked conversation about the hopes and dreams they had, and the future they looked to. One dancer answered that she wanted to become a ballet teacher and share her aspirations with other students just like her. Chris replied with great enthusiasm that if you worked for your dreams and kept hope, everything is possible. 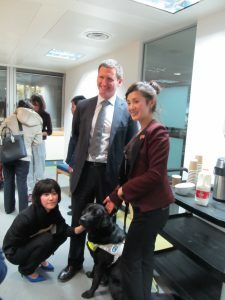 We hope that through meetings such as our time with Lord Holmes and other people with disabilities from the UK, the role that disabled North Koreans play in society, the view that society has of them and their rights will develop. But for these changes to take place, it needs growing understanding, acceptance and support from people around us – ordinary members of society, citizens, and you.